The past year proved to be a time of transition and experimentation with different methods for making photographic prints on wood and other substrates. In a new studio space, I found myself seeking new challenges, examining a myriad of techniques for transferring images from one substrate to another. Of these, the image transfer process described by Bonny Lhotka proved to be the most appealing to me because I could maintain the essential photographic roots of my work while creating the uniquely finished prints on wood or canvas surfaces to which I aspire. 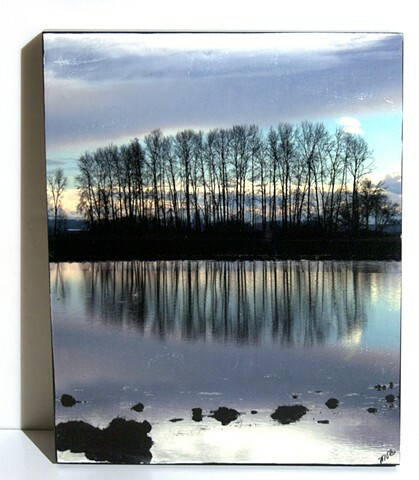 I have added an entirely new section to this site that exhibits new Image Transfer prints, primarily on wood and canvas. These combine traditional photographic work with digital print processing as well as the hand transfer of the image to the substrate. Each piece is enhanced with acrylic paint as required, followed by a varnish finish. The hand crafting I devote to each print individually melds the most basic elements of art and science into a uniquely tendered work, hand-made by me in my studio. At this time, the majority of my new work consists of Image Transfer pieces. Viewers can find some of my favorite older Pt/Pd prints in the Archive section. *VIEWING GUIDE: Open a gallery. Click on a photograph to view an enlargement; click again to see in full magnification. To advance the images, use keyboard arrows.